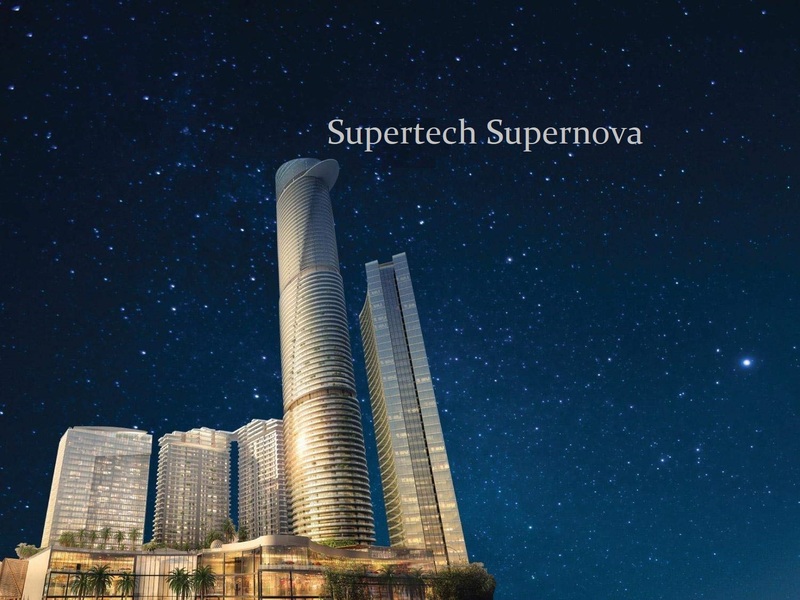 Supertech Supernova: Live amongst the stars, talk to the skies, and be on top of the world! How will it feel if you could fly high above everyone else and gaze at the landscape below as if you were sitting on a plane every day? Well, too good to be true surely. But not completely impossible! Offering the same excitement of hovering high above, yet with feet firmly on the ground, you can enjoy life at wuthering heights! Welcome to the concept of vertical living in luxurious style! NCR is perhaps one of the hottest and most developing regions when it comes to real estate across India. The region once smirked at the community living and ‘flats’ in high rises, priding themselves at the ‘bungalow’ feel. ‘Flats’ were looked at a property of distant Mumbai where space was a crunch. Or of those who did not probably have the pocket to get themselves a bigger house. The recent past few years have blown the winds of massive change from the traditional mindset. A global outlook has now revealed that luxury condos are indeed the order of the day. The sheer amenities that these enclaves offer, the security, the peace of mind, etc. are sure crowd-pullers of today. Noida is an area of NCR that has led the revolution of the apartment -complex projects. There are many wonderful enclosures here that have made lives of their inhabitants very convenient. These are pockets where one can forget the daily worries and simply unwind. Preferred by professionals and educated class, these are the epitomes of grandeur. Now the luxury condos have climbed notches above in the ultra-luxury segment. 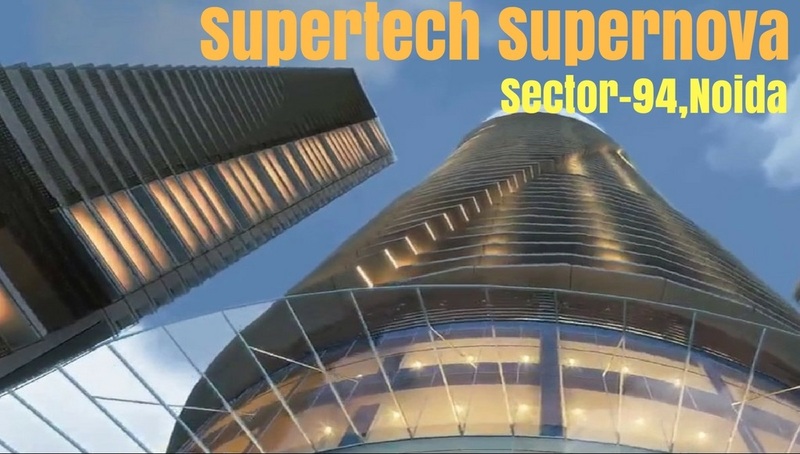 One such new project that is coming up here is the Supertech Supernova! It is unique as it is easily the tallest skyscraper in NCR and also one of the tallest in India. It rises to G + 80 floors! The iconic colossus is located at Sector 94 in Noida. 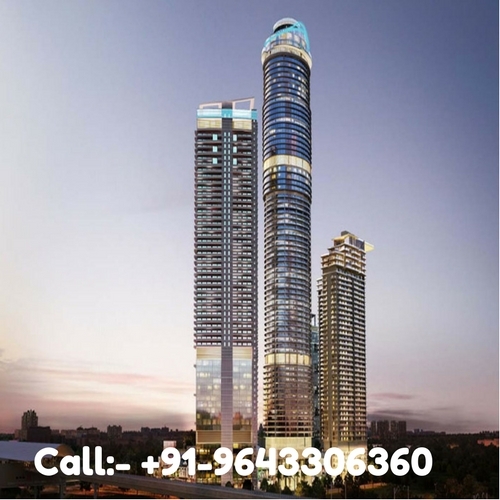 It contains homes in Studio, 2 BHK, 3 BHK and 4 BHK formats. The sizes here range from 595 sq. ft. to 4200 sq. ft., thus from cosy and compact sizes to expansive spaces, as the need may be. Irrespective of the size, each home is a feast for the eyes, with its elegance. There are smart kitchens, wide balconies, trendy bathrooms, stylish fittings, and decorative floorings. The fixtures are branded and the finish is suave. The 1 BHK apartments is fully furnished! There are limited edition Sky Mansions that have a separate club house and swimming pool! Each home is fully air-conditioned with VRV systems. The amenities here will make you feel like you live in a 5-star resort. A library and business lounge is elite additions. Rooftop garden and exclusive terraces bring vertical greenery at each level. For a regal feeling, there is a sky lounge and bar 270 m above the ground! 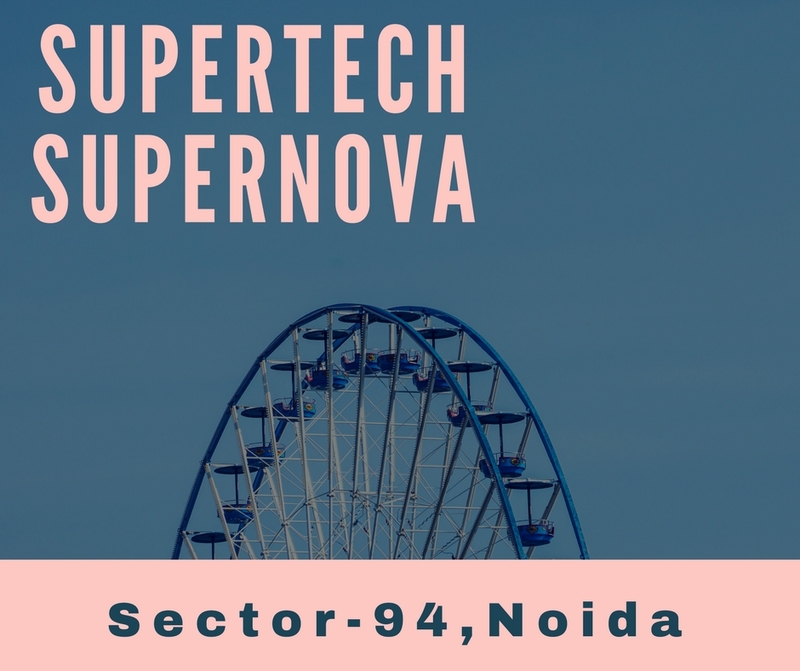 There are also 5-star hotels and serviced apartments within Supertech Supernova. There is an exclusive and rich clubhouse, day care centre, jogging track, party lawn, multipurpose hall, café, shopping centre, play area for kids, and a lot more! The project also contains office spaces. The location is such that connectivity is a great advantage from here. Jasola (Sarita Vihar) is 5 min. away, so is Noida Film City. 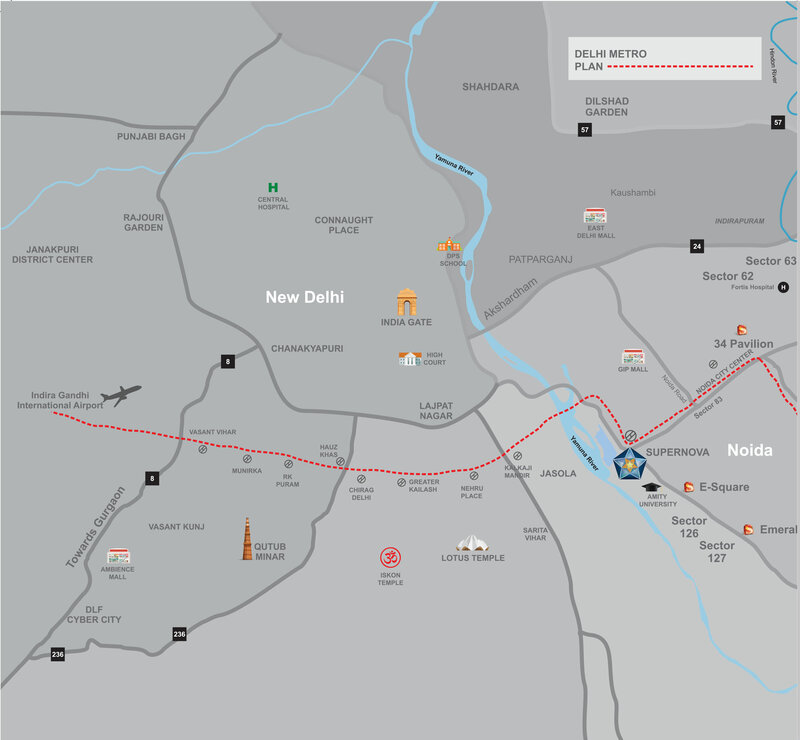 The retail centre of Noida, Sector 18 is close by, as is the metro line. The Botanical Gardens and The Great India Place Mall are close by. Many schools, hospitals, markets, etc, are at close hand from here. This is a proud project for the developer as well as for the owners. It is an architectural marvel indeed! Superetch Astrails is another commercial project developed from Supertech Group and it is located at Sector 94, Noida Expressway, Noida. Supernova Metro Station operational in Aug’17. Metro line will connect the Airport in 40 mins.